I saw this photo (taken by Erhard Pfeiffer) of an interior by Nicole Hollis (architect: Howard Backen) and was so inspired. This is exactly what I had envisioned for our dining room, and I am so excited to show it to Tim. 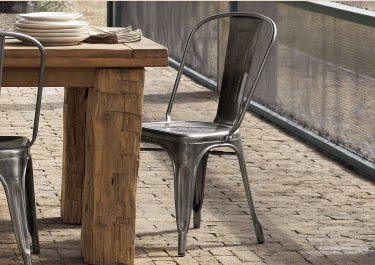 I love the combination of textures - wood, metal - and the juxtaposition of weathered country items with contemporary fixtures. I would urge you to review more of Ms. Hollis' work - she's a true talent and I love her combination of old and new. Now I just need to track down that lighting fixture, which I much prefer in the nickel to the black. I am sure it will be by Kevin Reilly and therefore priced accordingly. Birthday present? 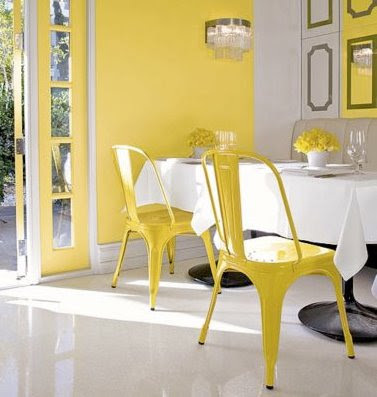 The chairs - Marais AC - were originally designed by Xavier Pauchard in 1934, and were used extensively in French bistros and brasseries. You can find them online at DWR, the Sundance Catalog, Conran and even from our old friend Pottery Barn. 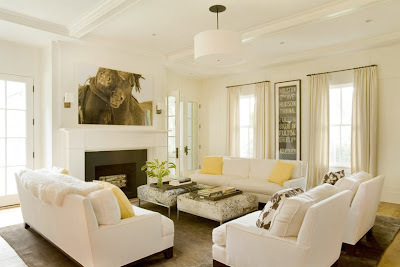 The interiors are by Christine Lane, who used Benjamin Moore's "Simply White" paint for every surface, Calcutta Gold marble and antique white oak floors. 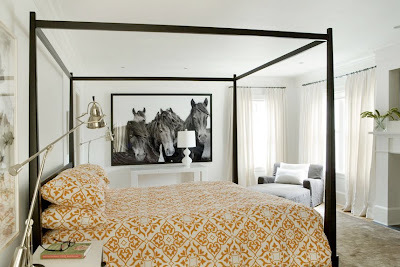 The living room and master bedroom feature photos from Roberto Dutesco's "The Wild Horses of Sable Island" series. The bedspread? Ikea. Shocking, I tell you. Lamps, Icon Group, Boston Design Center. Console, Jonathan Adler. Dining Room chairs, Antiques on 5, Boston Design Center. Artwork at right by Jonathan Borofsky. This sunroom is ridiculous. Even more ridiculous is the copy from the magazine "Under the framed artwork in the sunroom stands an antique French tin woodbox piled with rocks hand-picked by interior designer Christine Lane." I did not know you could get paid to pick rocks. I made a serious mistake in careers. But we'll forgive all that. I love this magazine. I adore this house - just wish I could see even more of its 8500 sq feet. My mom and I took a short road trip to Stonington, Connecticut this Sunday. Our official purpose was to evaluate her mother of the bride dress being made by Barraza. Who cares about a silk dress/pant/jacket/top when you can poke about for antiques? This town is RIDICULOUSLY cute - like Martha's Vineyard (although via 95) before it was wrecked by New Yorkers. She has been telling me about a fabulous antique store she thought I would love for ages. And it was fantastic. It's called Antiques, Ltd and it's at 530 Stonington Road. They have an incredible inventory of antiques, reproductions and upholstered pieces (all in white muslin so you can see their true shape). I could have taken one of everything, but will wait until the house is done. 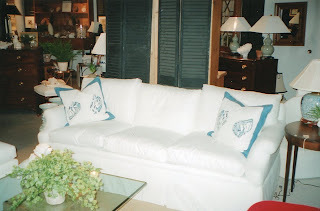 I drooled over a canary yellow Bamboo cabinet, and this white sofa, which is fabulous because it's not too tall. I did purchase a white porcelain bird from the clearance shelf for $10. I think it will work nicely with my ironstone! Two other antique stores of note in Stonington. 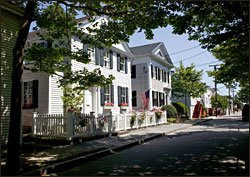 Grand & Water Antiques (at left) at 145 Water Street, in Stonington Borough. They had a delicious Swedish "breakfast set" which was basically a robin egg's blue set of dishes. And a fabulous antique foot warmer for the fireplace that read "Home Sweet Home." Devon House Antiques & Gallery (at right), 72 Water Street, had a lot of wonderful, warm wood pieces. Also a place to return when I'm looking for that perfect farm table. Devon House showcases a lot of painters, and while most were rather forgettable, one - Sarah Blair - really captured me. She creates teeny tiny little paintings of seascapes that are so touching, moody and intimate. 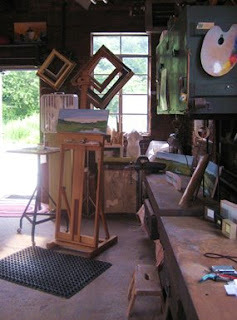 Here is a photo of her studio, and I have just emailed her to ask if I could see more of her work! Thanks Mom for such a fantastic introduction! 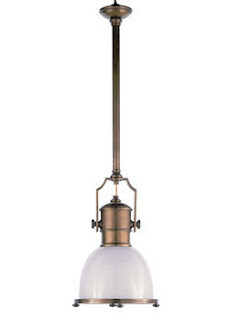 The go-to source for lighting to the trade? 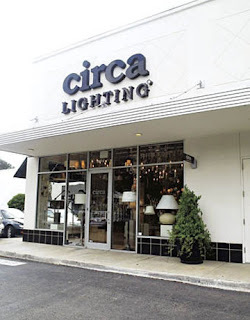 Circa Lighting. Their first store was in Savannah in 1998, followed by outposts in Atlanta, Charleston and Houston. Not only do they have their own collections, but designers such as Alexa Hampton, Eric Cohler, Thomas O'Brien, Barbara Barry and Sandy Chapman also design fixtures for them. 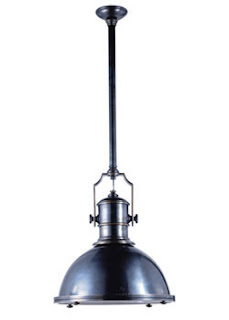 I am planning on the Country Industrial Pendant (3 of them) for the kitchen. 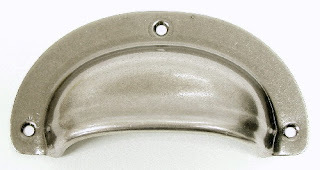 Milk glass, since we need the light, and either polished or brushed nickel. Be sure to visit their website for an amazing collection, usually ready to ship! 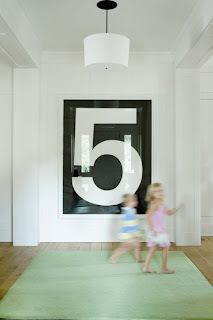 I have been reviewing with my builders that I would like a cathedral ceiling in both the kitchen and the master bedroom. Currently the kitchen has a gable that can be uncovered and insulated. The master bedroom one will be built. 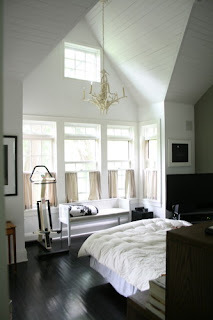 Sheet beadboard will be put up the gable - a bit cottage-y but I think appropriate for a farmhouse too. 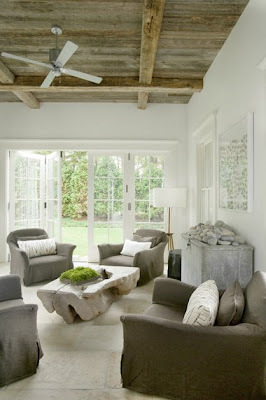 This is a great way to create a sense of soothing, soaring space even in rooms that aren't that big! I have two words. Christopher Peacock. Don't know who that is or what it refers to? That's very sad for you. I'm talking about the most exquisite cabinetry you have ever seen. Like don't even set foot in their showroom if you don't have $200K to spare. Well I think this is all absurd. Why is this vanity gorgeous? The hardware - those lucite pulls are delicious. Head to Period Furniture Hardware at 123 Charles Street in Boston and you can spiff up even an Ikea bath cabinet. I can't wait to buy mine. 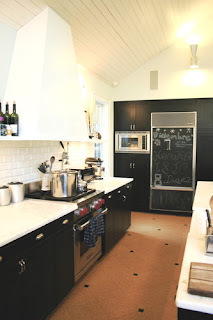 As for the kitchen, I just got a bid on my cabinetry from Homestead Kitchens in Acton, MA. 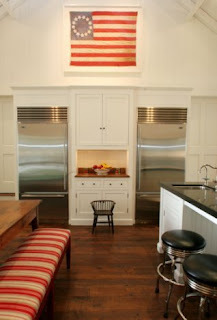 They sell Quality Custom Cabinets and Signature cabinets - both gorgeous. And for a cool $33K, I can have my cabinets in the style of Christopher Peacock without the absurd price. Signature developed a door to replicate the Christopher Peacock look - it's called the Ridgeview and is available this year for the first time. Oh and lest you think that price absurd (let's be honest, it's all ridiculous) it also includes my hardware courtesy of Top Knobs. 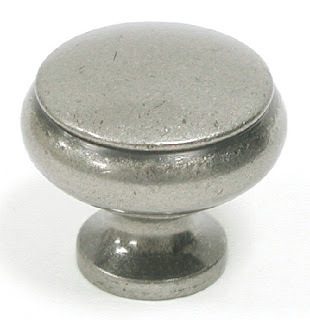 In antique pewter, I bring you M206, the Cumberland knob and M210, the Mayfair cup pull!! Bring it on Señor Peacock. I think this posting might be a bit controversial, and I am a bit loathe to post it. But since no one is reading this except for my good friends, I might as well share the information. I have been obsessed with my "lighting concept" for the house recently. I can't decide if I want the pendants in the kitchen, or rather whether I like the transition from the pendants to the handing candle fixture. This is just my design process. I throw myself into the pool and frantically review all of what's available. And usually come back to my first idea. But I digress. 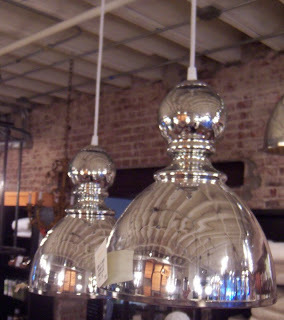 I was thrown for a loop because I saw these beautiful lamps from Pieces in Atlanta. You can now understand why I was questioning my lighting concept. For $985 apiece (the one on the left rather, the one on the right is a cool $495), they're not cheap. Now I thought to myself, I don't think those lamps should cost $985. I worked for Pottery Barn, and I know mark-ups. But the owner of Pieces - Lee Kleinhelter, pictured on the website with her fashionable golden retriever - has fabulous style. That's undeniable. But $985? Puh-lease. So I embarked on a 3 hour investigation into these lamps. Peppered with other activities, but it still took a while. 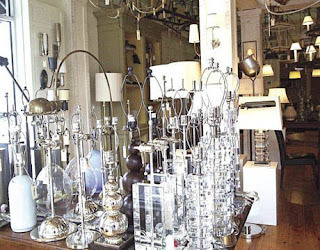 And I found the same lamp shown at right at Gore Dean in Washington, DC for $325. And then after a bit more poking, the same lamp at Red in Fredericksburg, TX for $165. The company who produces the lamps? Jamie Young. Finding this out took some sleuthing. The moral of the story is this. If you have a budget (like most of us do), it pays to do some research, particularly if you do not want to engage the services of a designer (back to the budget issue). 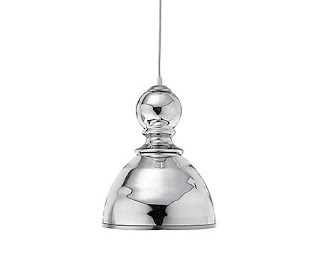 I suggest starting by googling the name of the product, in this case, I googled "mercury glass pendant." You'll be amazed at what comes up! And incidentally, I still haven't decided which pendants I am going to use. So I'll chalk up those 3 hours to business development.